Over $17,000 in college scholarships, back-to-nature field trips, and a true taste of college life will be on the line for high school students who attend this year’s Natural Resources Conservation Workshop (NRCW) on June 9-13 at Abraham Baldwin Agricultural College. Students participating in the workshop will attend lectures and hands-on activities to boost their knowledge of Georgia’s vital natural resources. Local, state, and federal natural resource agencies and specialists from universities will host these sessions. The workshop provides students with a taste of college life while delivering valuable insight into careers through their counselors and instructors. These professionals consist of ABAC admissions personnel, the Department of Natural Resources, the USDA-Natural Resources Conservation Service, the Georgia Forestry Commission, the University of Georgia (UGA) Cooperative Extension Service, the Warnell School of Forestry at UGA, the Georgia Soil and Water Conservation Commission, and many private industries and organizations. Tuition is $175 per student before the early bird deadline of May 1. After May 1, tuition increases to $200 per student to attend the workshop. The final application deadline is June 1. Tuition is usually provided to the students by local Conservation Districts, local businesses, and individuals. Interested students must first complete the online application available online at www.abac.edu/nrcw . They will then be contacted by a District Program Assistant, who represents a local Conservation District, to help them complete the registration process. NRCW scholarship sponsors include the Georgia Association of Conservation Districts, the ABAC Foundation, Georgia Chapter of American Public Works Association, Georgia Mining Association, Workshop Scholarship Fund, Flint River Soil and Water Conservation District, UGA’s Warnell School of Forestry, Fort Valley State University, Blue Ridge Mountain SWCD and Young Harris College, Piedmont Conservation Products, the Georgia Chapter NOPBNRCSE and West Georgia SWCD. This workshop is FULL! Please sign up for our newsletter to be notified of future workshops! Registration starts at 8:30am. Program starts at 9:30am. Light breakfast, coffee, and lunch will be served. This is a combined Group Meeting + Supervisors Training. There will be a Group Business session that morning and the remainder of the day will be GACD Training topics. *The GACD Group 4 Supervisors consist of elected and appointed district supervisors from 38 counties in Georgia to include: Pine Mountain, Chattahoochee, Harris, Marion, Muscogee, Talbot, Clay, Lee, Quitman, Randolph, Schley, Stewart, Sumter, Terrell, Webster, Baker, Calhoun, Decatur, Dougherty, Early, Grady, Miller, Mitchell, Seminole, Ben Hill, Brooks, Colquitt, Crisp, Irwin, Thomas, Tift, Turner, Worth, Berrien, Clinch, Cook, Echols, Lanier, and Lowndes. Feral swine have become increasingly detrimental in Georgia, causing significant damage to agricultural crops and natural resources throughout the State. A number of agricultural and natural resource organizations are partnering together to bring Georgia’s top experts on feral swine together in a series of educational workshops for farmers and landowners. 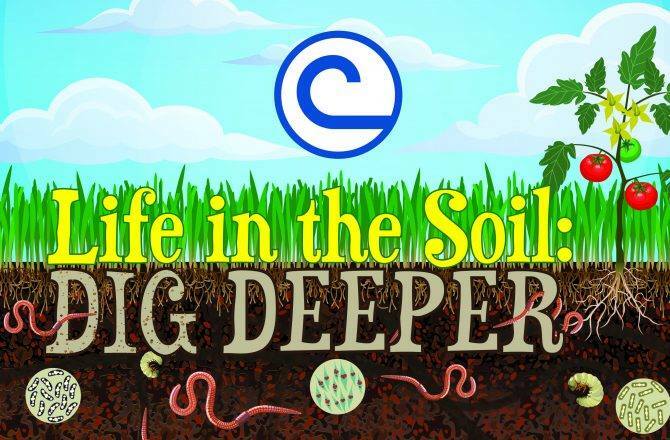 Topics will include disease issues, swine biology, economics, water quality issues, effective control techniques, transport issues, and regulations to be followed by a question and answer panel of experts. Each workshop will also include a feral swine trapping demonstration. Partnering agencies for this effort include the U.S. Department of Agriculture (USDA) Natural Resources Conservation Service, USDA Wildlife Services, Georgia Association of Conservation Districts, Georgia Department of Natural Resources, Georgia Department of Agriculture, University of Georgia, and Georgia Farm Bureau. Registration for this event is available at https://gooutdoorsgeorgia.com/ on the “Events” section. Feral swine have become increasingly detrimental in Georgia, causing significant damage to agricultural crops and natural resources throughout the State. 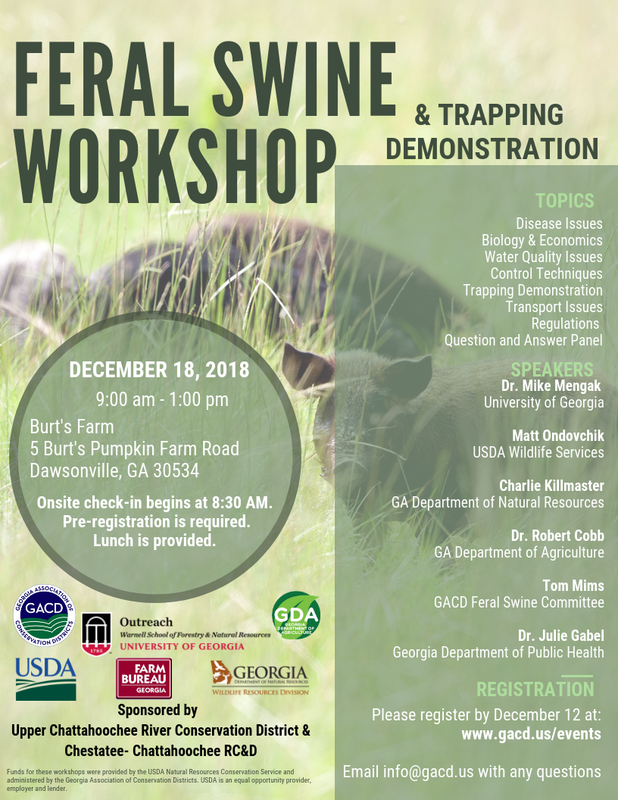 A number of agricultural and natural resource organizations are partnering together to bring Georgia’s top experts on feral swine together in a series of educational workshops for farmers and landowners in November and December. 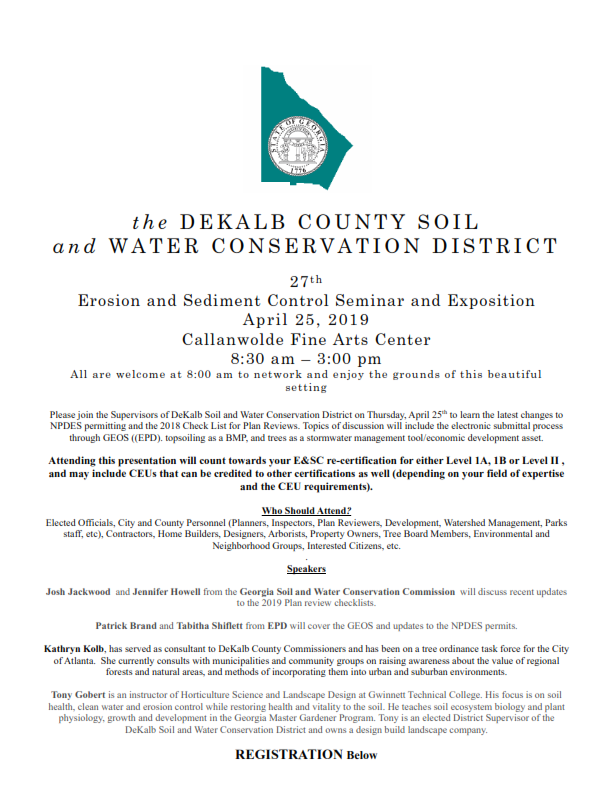 Save the date for GACD's 2018 Annual Meeting at Lake Oconee! Visit our 2018 annual meeting page for details on registration, reservations, sponsors, and exhibitors! Our partners at Georgia Farm Bureau have scheduled their annual meeting. 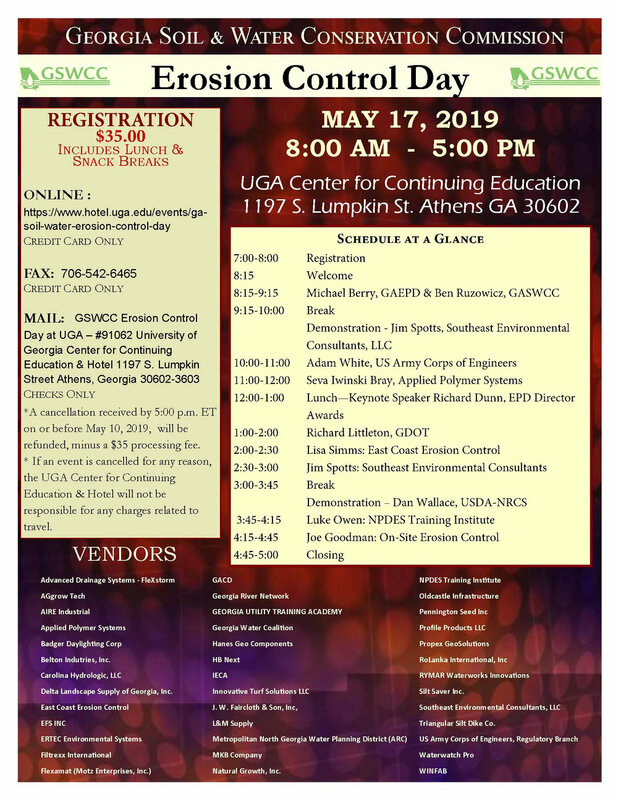 Come visit us at our GACD booth while you are there! GACD leadership and conservation partners will come together to host a joint annual group meeting for districts statewide in addition to annual supervisor training. I will attend the September 19 GACD meeting. I will need a hotel the evening of September 18. It is with great pleasure that we invite you to the 2017 GACD Annual Meeting on February 9-12, 2017 at Lake Lanier Islands. We have an exciting agenda planned including special invited guest speakers for the Hall of Fame Awards Dinner, General Session and Breakout Sessions all centered on this year’s theme of Navigating Georgia’s Water Resources. In addition, we will be celebrating 80 Years of Conservation Districts in Georgia. So please make plans to attend this very special GACD Annual Meeting. Click here for the 2017 GACD Annual Meeting flyer. The conference will be held at Legacy Lodge at Lake Lanier Islands in Buford, Georgia. Hotel rooms at Legacy Lodge may be reserved at special GACD rate of $109 per room per night. You can make your hotel room reservations by phone, by email or by online link. Phone by calling 1-800-840-5252 or 770-945-8787 or 678-318-2018. Or book your reservation online by clicking here. Please click here to download the Registration Form for the 2017 Annual Meeting. Pre-registration ends December 15th. Please return your form and payment to: GACD, P.O. Box 1134, Ringgold, GA 30736. You may also find the form online at www.GACD.us/events. Includes draft agenda and hotel/registration information.